Kings Fool - The Only Business Card You'll EVER Need! guaranteed to make you money! a business card AND a card trick. Point out the King is clearly in the middle of the five cards. put a paper clip on the King of Hearts. MOST PEOPLE WON'T GET IT ON THE FIRST TRY! MANY WON'T GET IT ON THE SECOND TRY! other business card you will ever own. "The professional quality cards are top quality and worth every penny. I plan on showing this item to my trade show clients for the coming year. Click here to read the entire reveiw. 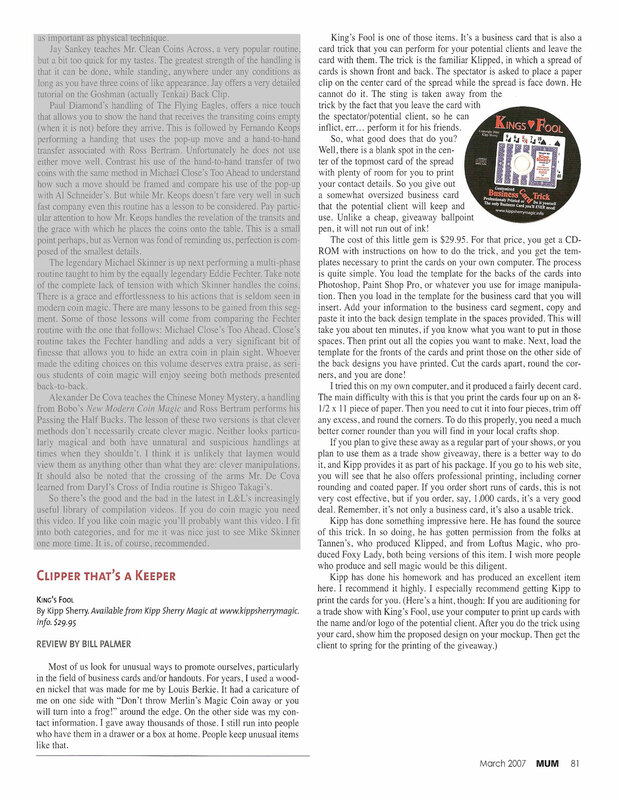 "Kipp has done his homework and has produced an excellent item here. Click here to hear the entire .mp3 reveiw. in one of two ways. Offer your clients a value added service. Have the cards printed with your clients logo and business information, then use them as a trade show giveaway at the booth. Kings Fool business cards cost less than cheap giveaway pens and they will be shown to more people than the giveaway pen will be. Custom print the Kings Fool business cards to say "I saw (magician) performing at (client)". Add your clients logo and get them to pay the cost, or split the cost with you. 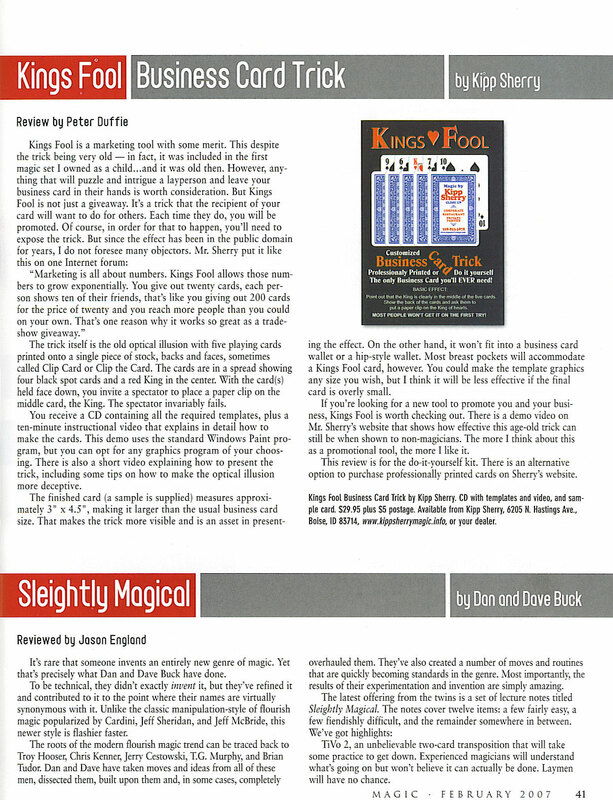 If you normally sell effects after your show, add Kings Fool to your product list and sell them for $2.00 each as a card trick. I'll bet you've never sold your business card before. Radio stations are always looking for items to give away. Give them your Kings Fool business cards and get extra air time for FREE while promoting your upcoming show at the same time. Since Kings Fool is not a standard size business card, it will not be tucked away into a business card file (or file 13). And the people that get one won't want to tuck it away, they will want to show it to all of their friends. That's multiple exposure for the same investment. I can't think of another business card that will be shown to multiple people. The real power of Kings Fool is multiple exposure for the same investment. It's just good business any time you can get other people to spread your name for you. It's all about the numbers! 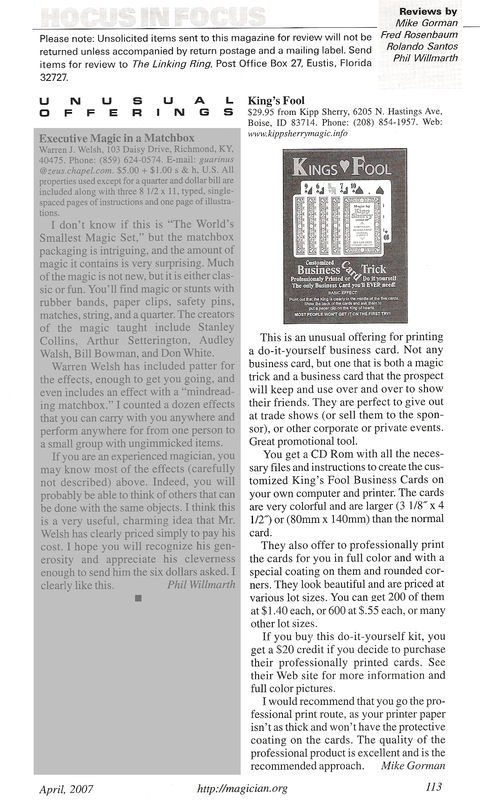 Your business doesn't need to be related to magic to benefit from the marketing power of Kings Fool business cards. 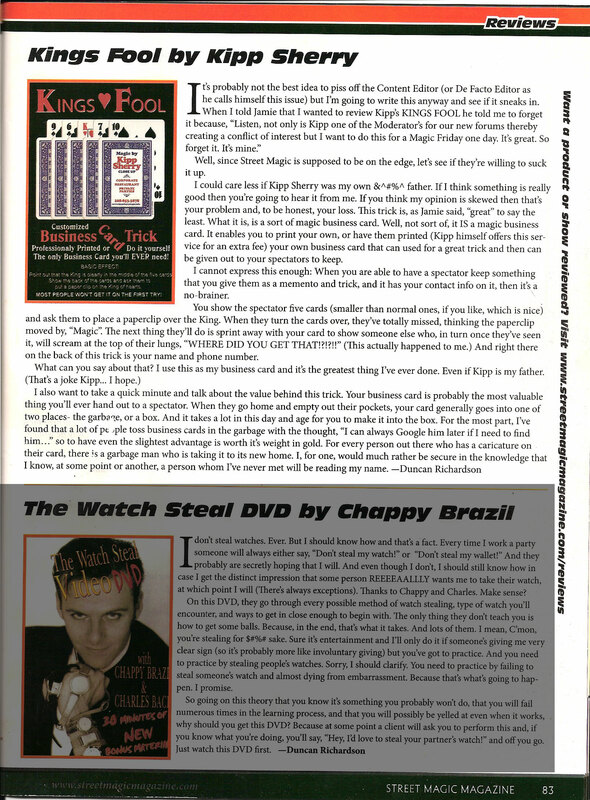 I tried to research who originally created the optical illusion used in Kings Fool and was unable to do so. It appears to be so old that it may be in public domain by now. But I would like to recognize those who have similar products on the market today, and who have granted permission for me to use the effect for Kings Fool.